Mouse anti myelin proteolipid protein antibody, clone plpc1 (MCA839G) used for the detection of proteolipid protein on formalin fixed, paraffin embedded brain tissue. NL scheme and PLP staining. (A) Type-I NL with demyelination of the whole width of the cortex (#) and adjacent WM (*). (B) Type-II intracortical lesion evolving around a vessel. (C) Type-III subpial NL. Demyelination spreads from the pial surface until cortical layer 3. Scale bars represent 500 μm. 7 Tesla Magnetic Resonance Imaging to Detect Cortical Pathology in Multiple Sclerosis. NLs on MRI and tissue sections stained for PLP and iron. 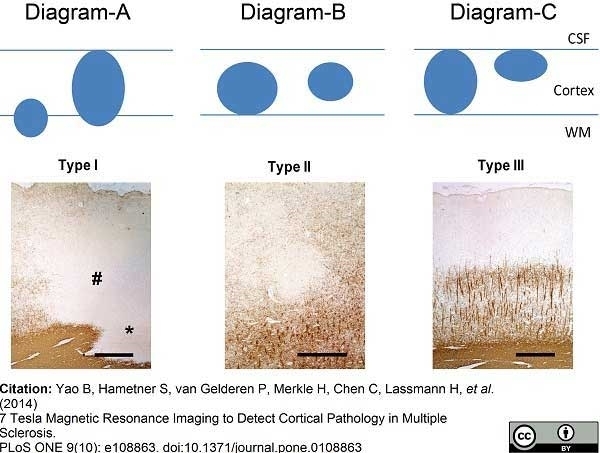 Examples Examples of NLs from tissue MS1 (A, B and C) identified on MRI magnitude (TE = 25.2 ms) and R2* images as well as color-coded PLP-staining and iron staining. Red arrows point towards NLs identified by MRI and confirmed to correspond to area of demyelination by the color-coded PLP staining. Blue arrows point towards NLs identified by the color-coded PLP staining and only retrospectively identified by MRI. 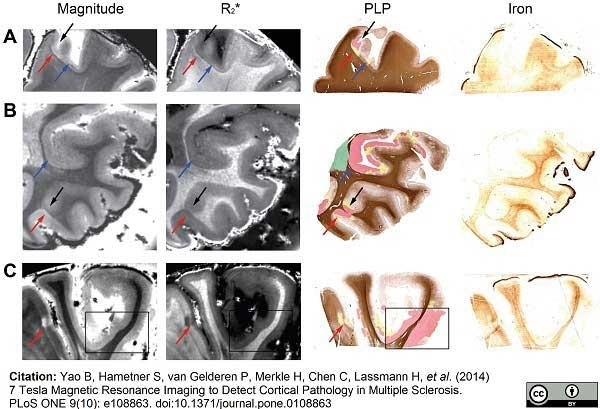 Black arrows and black box point towards NLs identified by the color-coded PLP staining and not by MRI even upon a second retrospective image inspection. In the black box we include a large area of demyelination which goes entirely undetected by MRI. In the color-coded PLP staining of figure: green = complete WM demyelination, red = complete GM demyelination, yellow = areas of variably reduced myelin density. Iron loss in NLs. PLP myelin staining (B) and iron staining (C) on two consecutive slides of tissue MS2 disclose iron loss together with myelin loss in a NL (red arrows). Higher magnification (D, E, F, G) of PLP (D, F) and iron stainings (E, G). In NAGM (D, E), iron is present in oligodendrocytes (black arrow and inset in E) and myelin sheaths. In a NL (F, G), iron is removed from the demyelinated cortical parenchyma and present in perivascular macrophages and microglia (black arrow and inset in G). Validation of monomer and oligomer preference of αSN interacting proteins. Proteins pulled down by monomer αSN (M), oligomer αSN (O), and buffer control (B) from porcine (A-F) and human (G-I) brain extracts were analyzed by immunoblotting using antibodies against antigens selected among the monomer and oligomer binding proteins. Monomer binding antigens were myelin proteolipid protein (mPLP) and Abl interactor 1 (Abl1) and oligomer binding proteins were glial fibrillary acidic protein (GFAP), glutamate decarboxylase 2 (GAD2), and synapsin 1 (Syn1). VAMP-2 was tested because it has been reported to bind &apha;SN, although it was not detected in our proteomic analysis. One representative of three experiments is presented for porcine αSN binding proteins (A, C, E), and the quantification of the three experiments is presented in panels B, D, F. The quantification of bands was performed after subtracting the non-specific signal in the buffer control from the specific bands in monomer and oligomer samples. Bars represent mean ratio between monomer and oligomer ± S.D. of the three replicates. The values for binding to monomer and oligomer were compared by Student's t-test and the resulting p-values are listed above the bars. * Indicates that the band intensity from oligomer did not differ significantly from background making quantifications impracticable. In order to ensure that the interaction were not due to species differences between human and porcine proteins we conducted validations in human brain extracts. One representative of two experiments is presented for each validated protein. 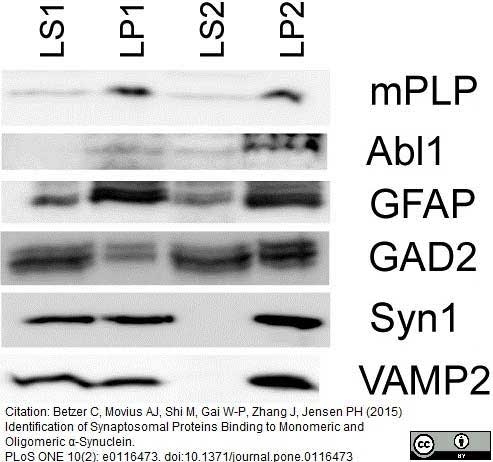 The validation for both porcine and human of mPLP, Abl1, Syn1 and VAMP-2 was conducted in the LP2 fraction enriched in synaptic vesicle and the validation to GFAP and GAD2 in the LS1 fraction of synaptosomal lysate. From: Betzer C, Movius AJ, Shi M, Gai W-P, Zhang J, et al. (2015) Identification of Synaptosomal Proteins Binding to Monomeric and Oligomeric α-Synuclein. Published customer image:Mouse anti myelin proteolipid protein antibody, clone plpc1 (MCA839G) used for detection of proteolipid protein in formalin fixed, paraffin embedded multiple sclerosis brain tissue. Microglia associated with preactive lesions express NADPH oxidase-2 subunits. Clusters of HLA-DR immunopositive microglia (B and C, HLA-DR) in NAWM (PLP, A) express various NADPH oxidase-2 subunits, including gp91phox (D), p22phox (E) and p47phox (F) in consecutive sections. Figure1C-F represents a magnification of the outlined square in Figure1B. Original magnifications A, B: 4×, C-F: 40×. From: van Horssen J, Singh S, van der Pol S, Kipp M, Lim JL, Peferoen L, Gerritsen W, Kooi EJ, Witte ME, Geurts JJ, de Vries HE, Peferoen-Baert R, van den Elsen PJ, van der Valk P, Amor S.
Clusters of activated microglia in normal-appearing white matter show signs of innate immune activation. J Neuroinflammation. 2012 Jul 2;9:156. Preactive lesions are composed of clusters of HLA-DR-positive microglia. In NAWM, i.e., in the absence of apparent myelin loss (A, E: proteolipid protein) preactive lesions are defined as circumscribed nodules of activated microglia expressing HLA-DR (B, C) and CD68 (D). Preactive lesions are predominantly observed in blocks containing active lesions (E: proteolipid protein; F, G: HLA-DR). Figure1G represents a magnification of the outlined square in (F). In some cases microglial nodules are surrounded by a halo devoid of microglia (H: HLA-DR). Original magnifications: A, B: 20×; C, D: 40×; E, F: 4×; G, H: 40×. 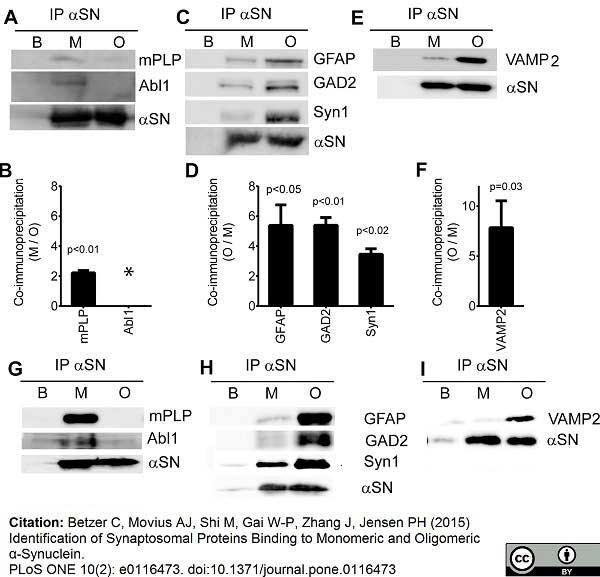 Presence of &apha;SN binding proteins chosen for validation in synaptosomal fractions. 30μg of each of the fractions synaptosomal membranes LP1, synaptosomal lysate (LS1), synaptic vesicles (LP2) and synaptosomal cytosol (LS2) were immunoblotted, and analyzed for the presence of myelin Proteolipid protein (mPLP), Abl interactor 1 (Abl1), Glial fibrillary acidic protein (GFAP), Glutamic acid decarboxylase 2 (GAD2), Synapsin 1 (Syn1), and Vesicle associated membrane protein 2 (VAMP2). Identification of Synaptosomal Proteins Binding to Monomeric and Oligomeric α-Synuclein. Mouse anti Myelin proteolipid protein, clone plpc1 (MCA839G) used for the evaluation of PLP expression in human brain by immunohistochemistry on formalin fixed, paraffin embedded biopsy sections. 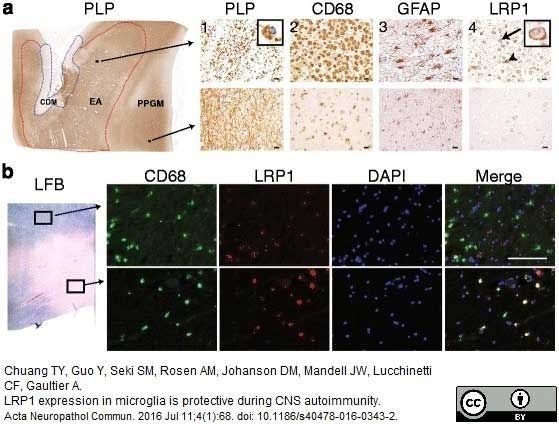 From: Chuang TY, Guo Y, Seki SM, Rosen AM, Johanson DM, Mandell JW, Lucchinetti CF, Gaultier A.
LRP1 expression in microglia is protective during CNS autoimmunity. Acta Neuropathol Commun. 2016 Jul 11;4(1):68. Mouse anti myelin proteolipid protein antibody, clone plpc1 (MCA839G) used for the evaluation of PLP expression in human brain by immuohistochemistry on formalin fixed, paraffin embedded tissue sections. Basic Pathology of HAE: a: Topographical distribution of demyelinated lesions in the brain shows the prominent periventricular demyelination with peri-venous extensions (Dawson Fingers) and demyelinated plaques in the cortex and the deep grey matter nuclei; green: white matter lesions, red: cortical and hippocampal lesions, blue: lesions in thalamus and basal ganglia; the blue dots in the meninges show the location of prominent meningeal inflammatory infiltrates; b: Sections stained with luxol fast blue depicts the demyelinated lesions in the white matter; c: Immunocytochemistry for CD68 shows the accumulation of macrophages at the edge of active white matter lesions; d: Double staining for proteolipid (PLP) protein (red) and mRNA (black) reveals loss of oligodendrocytes within the lesion and the presence of numerous macrophages with PLP degradation products at the lesion edge; e: In sections stained for phosphorylated neurofilament only a mild to moderate reduction of axonal density is seen in the lesions; the insert shows a neuron in the substantia nigra with an α-synuclein reactive Lewy body. f: The section stained for iron shows prominent iron accumulation in the deep grey matter nuclei and at the cortico/subcortical border; some increased iron reactivity is seen within the periventricular demyelinated lesions: g: Subpial cortical lesion in the insular cortex (Fig. 1a) with selective loss of myelin in the cortex; h, i: The subpial lesions shows an actively demyelinating edge with high density of activated microglia (Iba-1, Fig. 1h), expressing the phagocytosis associated marker CD68 (Fig. 1i). j, k: In the meninges, covering the active lesion, inflammatory infiltrates are seen, composed or perivascular T-cells (CD3, Fig. 1j) and B-cells (CD20, Fig. 1k); l: The active lesion edge of the cortical lesions contains numerous macrophages with PLP reactive myelin degradation products; m: Activated microglia and macrophages at the lesions edge express NADPH oxidase. 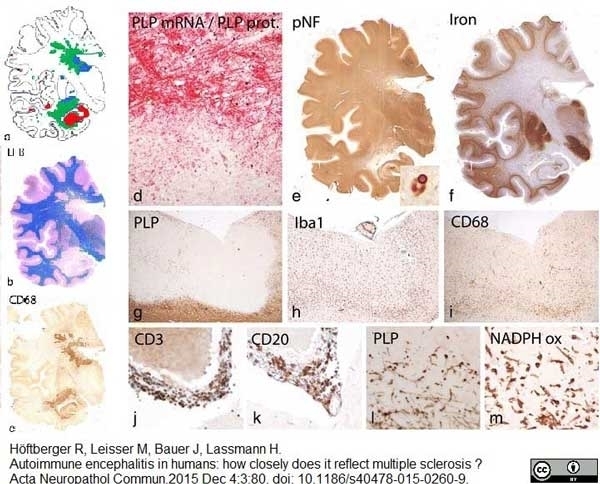 From: Höftberger R, Leisser M, Bauer J, Lassmann H.
Autoimmune encephalitis in humans: how closely does it reflect multiple sclerosis? Acta Neuropathol Commun. 2015 Dec 4;3:80. Mouse anti myelin proteolipid glycoprotein antibody, clone plpc1 (MCA839G) used for the demonstration of plp expression in brain tissue from multiple sclerosis affected specimens. Side-by-side R2* (A), LFB (B), PLP (C) and TBB (iron, D) staining. One can appreciate examples of ROIs showing WM-L (solid red arrow on PLP and R2* maps), DWMI (dashed red arrow on PLP and R2* maps), and areas of increased iron accumulation in the dGM (red rectangle on TBB and R2* maps). 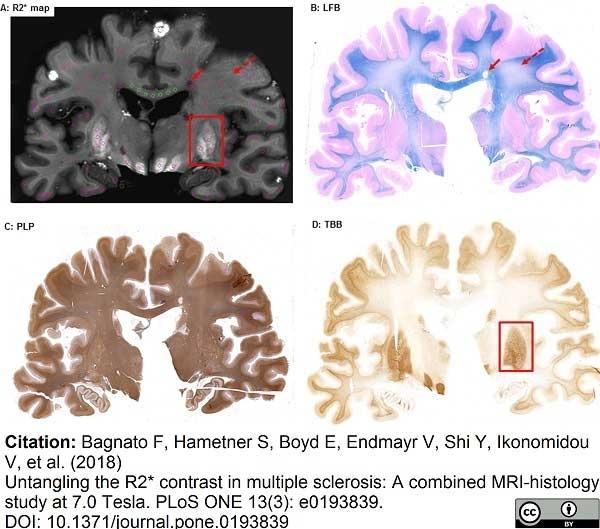 Untangling the R2* contrast in multiple sclerosis: A combined MRI-histology study at 7.0 Tesla. Mouse anti myelin proteolipid protein antibody, clone plpc1 (MCA839G) used for the visualization of myelin in a model of experimental autoimmune encephalomyelitis in rhesus monkey brain by immunohistochemistry on formalin fixed paraffin embedded tissue sections. Characterization of rhesus monkey EAE brain pathology. Tissue was stained for myelin (PLP)The image scale bar is 100 μm. 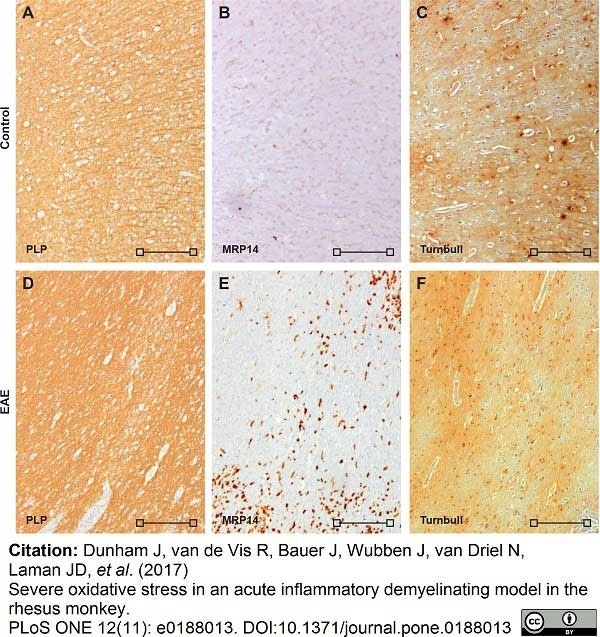 Severe oxidative stress in an acute inflammatory demyelinating model in the rhesus monkey. Expression of oxidative stress pathway markers. Expression of key markers of the oxidative stress pathway was analyzed by immunohistochemistry. Shown is a representative brain area with EAE lesions stained for PLP (A), MRP14 (B) and Iba-1 (C). Image scale bars are 500 μm. Iron accumulates in rhesus brain. To determine tissue specific iron, Turnbull staining was performed on healthy control and EAE brain tissue from rhesus monkeys. Shown are overview images of PLP (A,D), MRP14 (B,E), and Turnbull (C,F) of a control brain (A-C) and an EAE brain (D-F). In the control brain, iron accumulation was strongest in the GM (A,C). In the EAE brain no distinct pattern of iron staining emerged. Image scale bars are 200 μm (open square). Shown are adjacent stains of PLP (A), MRP14 (B), p22phox (C), SOD2 (D) and Iron (E) of an EAE lesion. The image scale bar is 100 μm. Mouse anti myelin proteolipid protein antibody, clone plpc1 recognizes myelin proteolipid protein (PLP) in many mammalian species (Stoffel et al. 1985). Clone plpc1 also recognizes the alternative PLP splice variant lacking part of the cytoplasmic domain (amino acids 117-151), known as DM20 (Simons et al. 1987) . PLP encodes the major protein components of compact CNS myelin and mutations in the PLP gene can lead to severe dysmyelinating disease (Hudson et al. 1989). Synthetic peptide GRGTKF corresponding to C terminal region of myelin proteolipid protein. Rosetti, C.M. & Maggio, B. (2007) Protein-induced surface structuring in myelin membrane monolayers. Grade, S. et al. (2010) Functional identification of neural stem cell-derived oligodendrocytes by means of calcium transients elicited by thrombin. Moharregh-Khiabani, D. et al. (2010) Effects of fumaric acids on cuprizone induced central nervous system de- and remyelination in the mouse. Bramow, S. et al. 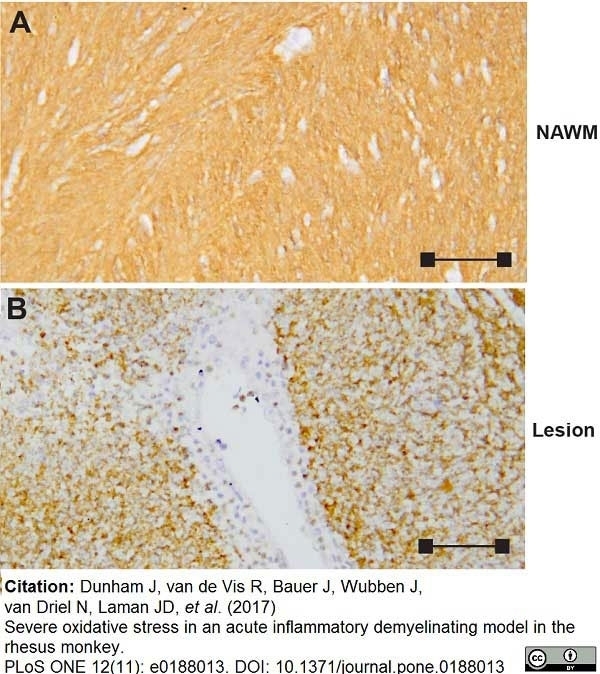 (2010) Demyelination versus remyelination in progressive multiple sclerosis. Kooij, G. et al. (2010) Adenosine triphosphate-binding cassette transporters mediate chemokine (C-C motif) ligand 2 secretion from reactive astrocytes: relevance to multiple sclerosis pathogenesis. Jaśkiewicz, E. et al. (2005) Expression of recombinant forms of human 21.5 kDa myelin basic protein and proteolipid protein in CHO cells. Acta. Biochim. Pol. 52: 863-6. Coulpier, F. et al. (2010) CNS/PNS boundary transgression by central glia in the absence of Schwann cells or Krox20/Egr2 function. Massa, P.T. et al. (2002) Critical role for protein tyrosine phosphatase SHP-1 in controlling infection of central nervous system glia and demyelination by Theiler's murine encephalomyelitis virus. Pomeroy, I.M. et al. (2005) Demyelinated neocortical lesions in marmoset autoimmune encephalomyelitis mimic those in multiple sclerosis. Roemer, S.F. et al. (2007) Pattern-specific loss of aquaporin-4 immunoreactivity distinguishes neuromyelitis optica from multiple sclerosis. Haider, L. et al. (2011) Oxidative damage in multiple sclerosis lesions. Baeten, K. et al. 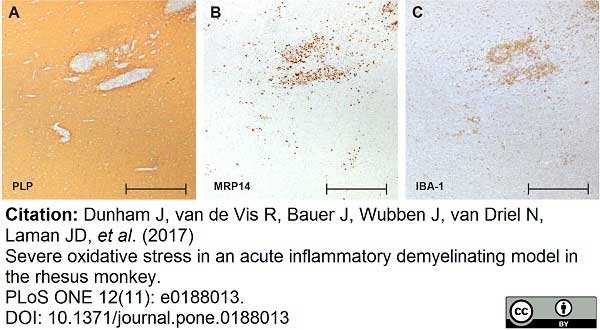 (2011) Tracking of myelin-reactive T cells in experimental autoimmune encephalomyelitis (EAE) animals using small particles of iron oxide and MRI. Geurts, J.J. et al. (2007) Extensive hippocampal demyelination in multiple sclerosis. J Neuropathol Exp Neurol. 66: 819-27. Kooi, E.J. et al. (2011) Cholinergic imbalance in the multiple sclerosis hippocampus. van Horssen, J. et al. (2006) NAD(P)H:quinone oxidoreductase 1 expression in multiple sclerosis lesions. Free Radic Biol Med. 41: 311-7.
van Horssen, J. et al. (2010) Nrf2 and DJ1 are consistently upregulated in inflammatory multiple sclerosis lesions. Free Radic Biol Med. 49: 1283-9. Seewann, A. et al. (2012) Postmortem verification of MS cortical lesion detection with 3D DIR. Popescu, B.F. et al. (2010) Absence of cortical demyelination in neuromyelitis optica. Kooi, E.J. et al. (2012) Heterogeneity of cortical lesions in multiple sclerosis: clinical and pathologic implications. Skripuletz, T. et al. (2013) Astrocytes regulate myelin clearance through recruitment of microglia during cuprizone-induced demyelination. Brain. 136 (Pt 1): 147-67. Bagnato, F. et al. (2011) Tracking iron in multiple sclerosis: a combined imaging and histopathological study at 7 Tesla. Gilmore, C.P. et al. (2006) Spinal cord gray matter demyelination in multiple sclerosis-a novel pattern of residual plaque morphology. Janssen, K. et al. (2016) Absence of CCL2 and CCL3 Ameliorates Central Nervous System Grey Matter But Not White Matter Demyelination in the Presence of an Intact Blood-Brain Barrier. Mol Neurobiol. 53 (3): 1551-64. Betzer, C. et al. (2015) Identification of Synaptosomal Proteins Binding to Monomeric and Oligomeric α-Synuclein. Jatana, M. et al. (2006) Combination of systemic hypothermia and N-acetylcysteine attenuates hypoxic-ischemic brain injury in neonatal rats. Pediatr Res. 59 (5): 684-9.
) using a chimeric antagonist monoclonal antibody against human CD40 is associated with altered B cell responses. J Neurosci Res. 80 (2): 211-25.
van Horssen, J. et al. 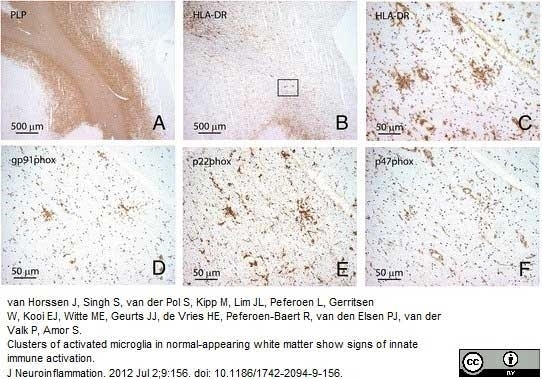 (2012) Clusters of activated microglia in normal-appearing white matter show signs of innate immune activation. Hinson, S.R. et al. (2012) Molecular outcomes of neuromyelitis optica (NMO)-IgG binding to aquaporin-4 in astrocytes. Proc Natl Acad Sci U S A. 109: 1245-50. Maccarrone, G. et al. (2016) MALDI imaging mass spectrometry analysis-A new approach for protein mapping in multiple sclerosis brain lesions. Chuang, T.Y. et al. (2016) LRP1 expression in microglia is protective during CNS autoimmunity. Acta Neuropathol Commun. 4 (1): 68. Cerina, M. et al. (2016) The quality of cortical network function recovery depends on localization and degree of axonal demyelination. Magalon, K. et al. (2016) Olesoxime favors oligodendrocyte differentiation through a functional interplay between mitochondria and microtubules. Russi, A.E. et al. (2016) Meningeal mast cell-T cell crosstalk regulates T cell encephalitogenicity. Jonkman, L.E. et al. (2016) Ultra-high field MTR and qR2* differentiates subpial cortical lesions from normal-appearing gray matter in multiple sclerosis. Mult Scler. 22 (10): 1306-14.
van Horssen, J. et al. (2016) Human endogenous retrovirus W in brain lesions: Rationale for targeted therapy in multiple sclerosis. Mult Scler Relat Disord. 8: 11-8. Shakhbazau, A. et al. (2016) Demyelination induces transport of ribosome-containing vesicles from glia to axons: evidence from animal models and MS patient brains. Mol Biol Rep. 43 (6): 495-507. Kilsdonk, I.D. et al. (2016) Increased cortical grey matter lesion detection in multiple sclerosis with 7 T MRI: a post-mortem verification study. Brain. 139 (Pt 5): 1472-81. Dooves, S. et al. (2016) Astrocytes are central in the pathomechanisms of vanishing white matter. J Clin Invest. 126 (4): 1512-24. Clarner, T. et al. (2015) CXCL10 triggers early microglial activation in the cuprizone model. J Immunol. 194 (7): 3400-13. Nakajima, M. et al. (2016) Auraptene induces oligodendrocyte lineage precursor cells in a cuprizone-induced animal model of demyelination. Skripuletz, T. et al. (2015) Pivotal role of choline metabolites in remyelination. Brain. 138 (Pt 2): 398-413. Klok, M.D. et al. (2015) Interferon-α and the calcifying microangiopathy in Aicardi-Goutières syndrome. Ann Clin Transl Neurol. 2 (7): 774-9. Popescu, V. et al. (2015) What drives MRI-measured cortical atrophy in multiple sclerosis? Mult Scler. 21 (10): 1280-90. Barateiro, A. et al. (2016) S100B as a Potential Biomarker and Therapeutic Target in Multiple Sclerosis. Mol Neurobiol. 53 (6): 3976-91. Alme, M.N. et al. (2015) Fingolimod does not enhance cerebellar remyelination in the cuprizone model. Fjær, S. et al. (2015) Magnetization transfer ratio does not correlate to myelin content in the brain in the MOG-EAE mouse model. Santos, E. et al. (2006) Peculiar and typical oligodendrocytes are involved in an uneven myelination pattern during the ontogeny of the lizard visual pathway. J Neurobiol. 66 (10): 1115-24. Ni, W. et al. (2015) Deferoxamine reduces intracerebral hemorrhage-induced white matter damage in aged rats. Tobin, W.O. et al. (2016) Clinical-radiological-pathological spectrum of central nervous system-idiopathic inflammatory demyelinating disease in the elderly. Michailidou, I. et al. (2016) Complement C3 on microglial clusters in multiple sclerosis occur in chronic but not acute disease: Implication for disease pathogenesis. Cerina, M. et al. (2017) The quality of cortical network function recovery depends on localization and degree of axonal demyelination. Brain Behav Immun. 59: 103-17. Zimmermann, J. et al. (2017) IL-17A Promotes Granulocyte Infiltration, Myelin Loss, Microglia Activation, and Behavioral Deficits During Cuprizone-Induced Demyelination. Zendedel, A. et al. (2016) Regulatory effect of triiodothyronine on brain myelination and astrogliosis after cuprizone-induced demyelination in mice. Metab Brain Dis. 31 (2): 425-33. Bihler, K. et al. (2017) Formyl Peptide Receptor 1-Mediated Glial Cell Activation in a Mouse Model of Cuprizone-Induced Demyelination. Bagnato, F. et al. (2018) Untangling the R2* contrast in multiple sclerosis: A combined MRI-histology study at 7.0 Tesla. PLoS One. 13 (3): e0193839. Dunham, J. et al. 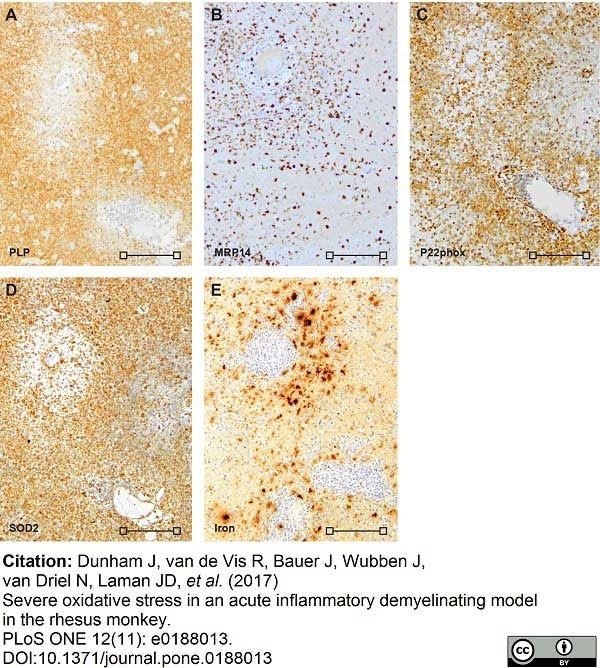 (2017) Severe oxidative stress in an acute inflammatory demyelinating model in the rhesus monkey. PLoS One. 12 (11): e0188013.